“National Treasure, The Sammon (main gate)”. 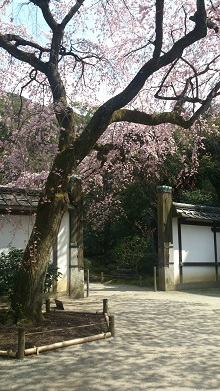 The cherry trees started blooming as if they were celebrating their marriage. 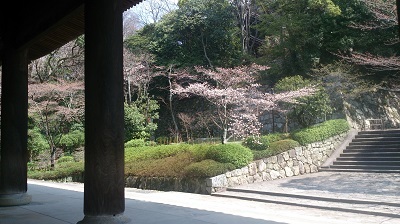 The cherry blossoms were in full bloom in “Hojo Garden” which was created in the early Edo period. Today, I assisted a wedding ceremony taken place at Chion-in, the head temple of Jodo (Pure Land) Sect. It was an international marriage between a foreign groom and a Japanese bride. Many guests traveled from overseas to attend the wedding. 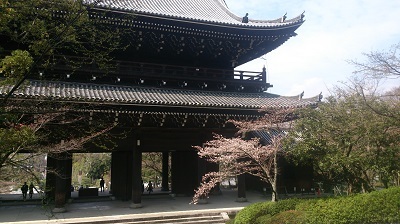 The wedding ceremony at the historical cultural heritage “Chion-in” with the beautiful cherry blossoms will forever remain in the memory of all the guests as well as the bride and groom.